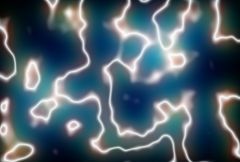 Creates an abstract texture resembling an electrical plasma effect. The Phase Speed parameter causes the pattern to automatically undulate over time. Noise Frequency: Default: 1.2, Range: 0.01 or greater. The spatial frequency of the initial noise texture. Increase to zoom out, decrease to zoom in. Noise Freq Rel X: Default: 1, Range: 0.01 or greater. The relative horizontal frequency of the initial noise texture. Increase to stretch it vertically or decrease to stretch it horizontally. Noise Octaves: Integer, Default: 4, Range: 1 to 10. Noise Seed: Default: 0.12, Range: 0 or greater. Add Grad: X & Y, Default: [0.1 0], Range: any. Determines the amplitude and direction of a gradient which orients the plasma lines. Increasing X makes the lines more vertical, and increasing Y makes them horizontal. Layers: Default: 4.5, Range: 0 or greater. The number of layers of plasma lines. Increase for a more striped effect. Determines the thickness of the plasma lines. Increase for thinner lines, decrease for thicker and brighter ones. Translation offset of the texture. Since the texture is procedurally generated it can be shifted with no repeating units or seams occurring. This parameter can be adjusted using the Shift Widget. Phase offset of the plasma lines. Phase speed of the plasma lines. If non-zero, the lines are automatically animated to undulate at this rate. Glow Brightness: Default: 3, Range: 0 or greater. Scales the brightness of the glow applied to the plasma texture. Glow Color: Default rgb: [0.6 0.8 1]. Scales the color of the glow applied to the plasma texture. The width of the glow applied to the plasma texture. Glow Width Red: Default: 0.6, Range: 0 or greater. Glow Width Grn: Default: 1.2, Range: 0 or greater. Glow Width Blue: Default: 1.8, Range: 0 or greater.